www.newworker.org | 100 DEAD, HOW MANY MORE? 100 DEAD, HOW MANY MORE? CORPORAL Gordon Pritchard of the Royal Scots Dragoon Guards last Tuesday became the 100th British soldier to die in Iraq, a victim of imperialist greed for oil that led to an illegal invasion and a war that continues to bring tragedy to both the people of Iraq and the men and women of the occupying forces. Pritchard, a father of three, was with a Land Rover convoy hit by an explosion. He died instantly. He had met and was photographed with Tony Blair in December when the Prime Minister paid a lightning visit to the troops in Basra. 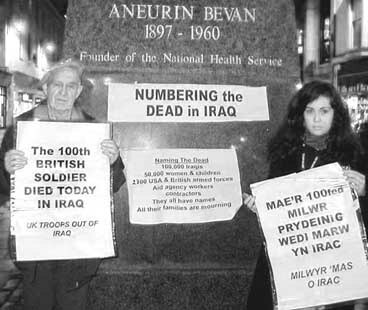 The 100th death of a British serving soldier had been tragically predictable and was followed swiftly by protest demonstrations throughout Britain, calling for the troops to be brought home to safety and the Iraqi people to be left to determine their own future. On Tuesday evening, in a Naming of the Dead ceremony, organised jointly by CND, Military Families Against the War and Stop the War, took place in Parliament Square. The names of the 100 dead soldiers and 100 dead Iraqis were read out. A statement from CND and the Stop the War Coalition said: “The 100th British soldier has been killed in Iraq – victim of an illegal occupation and war. It is a sadly significant statistic for this country to be added to the many tens of thousands of other victims of Tony Blair’s blood price – Iraqis, Americans, British and others. On Wednesday in 100 towns throughout Britain 100 similar protests were held. And the protests will continue at the weekend. Lewisham and Greenwich CND is one of many groups planning a town-centre protest. Participants will dress in black and white and will release 100 bio-degradable black balloons. David Leal of Lewisham and Greenwich CND said: “This is a sad milestone, and we are marking it out of respect for the servicemen and women, and out of a determination that all the killing shall stop. “Not only have 100 British servicemen been killed but also hundreds of thousands of Iraqis who’s deaths are not even counted. The morale of British troops in southern Iraq now is said to be very low and their prospects of being withdrawn are low. On Wednesday Foreign Secretary Jack Straw hinted at a possible withdrawal within the next 12 months. But he said a timescale was not yet available – indicating that he was merely responding to the bad news with platitudes meant to dampen the growing opposition and anger. Indeed Britain is now sending 6,000 extra troops to bolster the US-British axis occupation of Afghanistan. Straw told an international conference on the future of Afghanistan last week that Britain will contribute, along with the troops, an extra £455 million a year for the occupation there. The conference adopted targets that indicate British troops will have to stay in the region at least until 2010. It is not surprising now that swelling discontent among members of the armed forces is leading to calls for the formation of a federation to campaign for the rights of British servicemen and women. They have a long list of grievances, including the new deployment in Afghanistan, bullying and shortages of kit. They are also concerned about the possibility of being accused of committing abuse or war crimes against Iraqis, where they are made scapegoats for decisions and policies made by politicians and senior officers. The 100th British death in Iraq has also led to increasing demands in the House of Commons for Blair to be impeached. They are calling for a proper debate and a vote in the Commons. Among the 122 MPs who have signed the motion are Clare Short, Peter Kilfoyle, former Tory minister Douglas Hogg and Plaid Cymru MP Adam Price. ANGLO-AMERICAN imperialism likes to tell the Arabs that the West stands for democracy and progress in the Middle East. But it seems this only applies if the democratic process results in the election of those willing to do their bidding. This was clearly seen in last week’s Palestinian elections which resulted in a sweeping victory for the Palestinian Muslim Brotherhood, Hamas. The Arabs are told that if they did not comply with imperialist demands for “transparency”, “political reform” and “democracy” they can expect nothing from what is still called the “peace process” except political isolation and economic boycott. Now Hamas is told that is precisely what they can expect unless they abandon the political platform that swept them to electoral victory in the first place. No one, apart from the most rabid zionist or neo-conservative media pundit, could at all have been surprised at the swing to the Palestinian Islamic movement that led the armed resistance to the Israeli occupation in recent years. At the same time provided much-needed welfare to the poorest sections of the Palestinian community so often neglected by the Fatah administration in the “autonomous” zones in the West Bank and Gaza Strip. This was not entirely Fatah’s fault. Yasser Arafat’s national liberation movement was encouraged and bullied into accepting a one-sided Oslo agreement that promised much but produced very little for the Palestinian Arabs. A Palestinian Authority was established which had little power beyond the major towns and cities in the Occupied Territories and even that was cut down during the last intifada with the building of the concrete wall and the Israeli military encirclement of all the “autonomous” areas. The imperialists and zionists did their best to destroy the veteran Palestinian leader when he was alive, hoping that his successors would agree to the surrender peace that Arafat refused to sign at Camp David. What they didn’t foresee was the likelihood of Fatah being replaced by a movement that doesn’t want peace at any price and is not intimidated by collective punishment or death squads. The Arabs are used to imperialists telling them what to do. They’ve put up with it for over a 100 years. In the past these “lessons” were delivered at the point of a gun. These days they just as easily take the form of a lecture given by some minion of Bush and Blair during a tour of the Middle East. Though these neo-colonial sermons find a ready audience amongst venal and sectarian Arab oil princes and politicians prepared to serve as lackeys for the “new world order” they cut little ice with the Arab masses. The Arabs know that they’ve given the imperialists some lessons of their own in the past in Algeria, at Suez and in Aden and they’re teaching them some new ones in Iraq today. The imperialists say they want peace but do nothing to achieve it in Palestine. For decades they’ve supported the brutal Israeli occupation and the denial of the legitimate rights of the Palestinian people that have been upheld time and time again by the United Nations. The “peace process” is a sham and every Palestinian knows it. The real “road map” to a just and lasting peace in the Middle East was agreed by the UN Security Council after the 1967 Arab-Israeli war and re-affirmed after the October 1973 conflict. Israel must withdraw from all the occupied territories including Arab east Jerusalem and the Syrian Golan Heights. The Palestinian Arabs must be given the right to establish their own independent state and the Palestinian refugees must be given the right to return to their homes or be paid appropriate compensation by Israel if they choose not to go home. The Middle East conflict began in 1948 and barely a year has passed without bloodshed. Thousands of Israelis and many, many more Palestinians have died. Now after five major Arab-Israeli wars and decades of confrontation it is clear to everyone, apart from the ruling circles in Tel Aviv and the imperialists who pull their strings, that only a just settlement of the Palestinian problem can end the cycle of violence.